Firstly, i must thank D. dee for her very kind comment. Maybe it has been jealousy due to his recent greater success than Tim, or maybe it was his (until now) unnessecary on-court arrogance that made me dislike Andy Murray, but after logging on for the first time since Friday, and learning about his brilliant maiden ATP title in San Jose I really must correct myself. 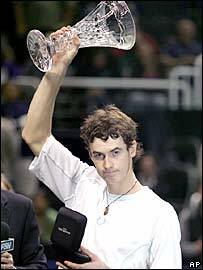 Echoing Tim’s last title run, Murray defeated some of the world’s best to prevail battling hard to beat top seed Andy Roddick in the semi’s in straight sets and then Lleyton Hewitt – who i must admit, i do not think is at %100 at the moment – from a set down in the final. So, credit where credit is due. Murray moves into the worlds top 50 after this (at 47) sitting just seven places below Tim and just four below Greg. I must be honest here and say that, unless Andy suffers some sort of lapse in concentration after this acheivement and/or Tim suddenly finds his best form and has no back trouble in Rotterdam, then Andy will soon become British number one. Elsehwere, Daniela is about to start her first round match (against the dangerous Na Li of China) in the star-studded Dubai Duty Free Open, a tournament in which she reached the quarters last year. *Picture from BBC Sport, click on the image to go to the BBC’s story of Andy’s triumph.